The Tom Dixon x Ikea collab is officially here. Ikea is already pretty great for small space decorators on a budget. Its 2018 collection was literally created for tiny apartments, and even the regular catalog is full of smart finds. But this latest Ikea partnership may be the retailer’s most efficient yet: The super-secret Ikea x Tom Dixon collab is officially here. Its inaugural piece? 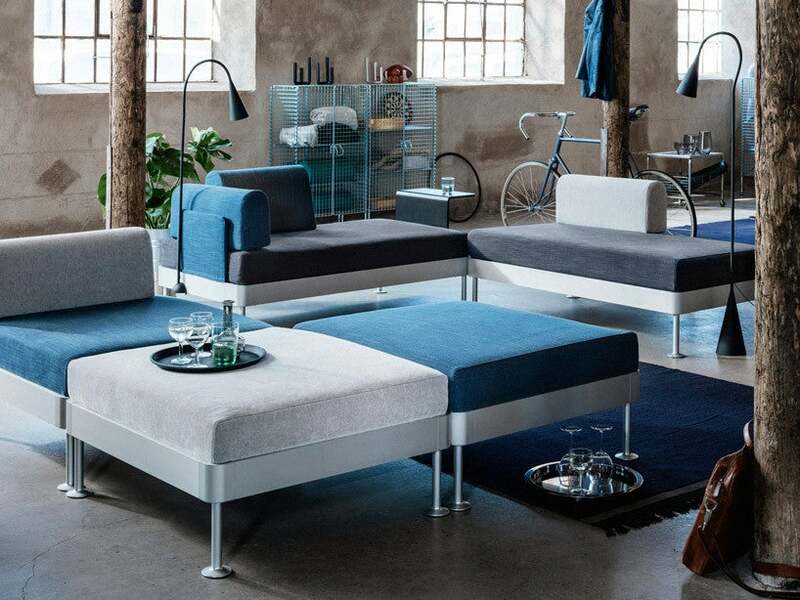 The Delaktig “hackable” modular sofa, which can be turned into everything from a sectional to a daybed. After much speculation, the Delaktig sofa premiered at 2017 Milan Design Week, and now almost a year later we finally have a launch date. Available in stores in February 2018, the sofa will be priced at around $400 and come in neutral-hued colors like light gray and dark blue. There is one small caveat, as the sofa will be first released in Europe—but Ikea promises a US version coming soon. According to Ikea, the idea for Delaktig was born out of a need for furniture that could adapt to and change with our increasingly busier lives. Citing smaller homes, new technology, and multitasking families, Ikea and Tom Dixon created the sofa to better facilitate socializing in a modern world. Armed with the catchy slogan, “Do Your Thing,” Delaktig is designed to mold to its owner’s lifestyle. The sofa replicates an industrial feel with its lightweight yet durable aluminium base. The ways in which Delaktig can be reconfigured are seemingly infinite, as the platform itself comes in a one, two, or three-seat version and can be further customized from there. A short video provides a glimpse into some of the ways Ikea predicts we’ll be using the sofa, spanning from a simple armchair to what looks like a double daybed. And it turns out that Tom Dixon loves a good Ikea hack as much as we do. When asked about his inspiration for the design, the designer referenced the “hacking community” surrounding beloved ikea items “These people that turn Ikea products into something unique and personal…I knew I wanted to explore that somehow. When I saw their ideas, it made me realize its potential—that our idea for an open-source platform actually works,” he explained. What makes this the ultimate ikea hack The availability of accessories, from armrests to a lamp to a even a side table. Mix and match to create your ultimate seating solution. Suffice it to say, we can’t wait until this smart sofa arrives stateside—and look forward to seeing how everyone further personalizes it in 2018. The Delaktig platform will not be available in Ikea U.S. stores until later this summer/fall. Consumers can view the stock checker on the Ikea website or contact their local ikea store to confirm when the product will be in stock/available.